If there is one city in Japan that is on just about everyone’s travel itinerary it has to be Kyoto. While the beautiful temples, shrines, and historic sites are what draws most people to Kyoto, the city has a lot more to offer. As more than a million foreign visitors every year discovers, the city provides world-class shopping, mouth-watering cuisine (Kyoto has seven three-star Michelin restaurants! ), and some of the most diverse accommodation options anywhere in Japan. With so many hotel and guest houses to choose from, deciding where to stay in Kyoto can be a challenge. Kyoto is divided into districts each with its own distinct personality. Where you want to stay depends on what you consider your top priority. Is it easy access to transportation, proximity to the popular sights, restaurants, and nightlife, or are you looking for somewhere to escape and enjoy the beautiful nature? 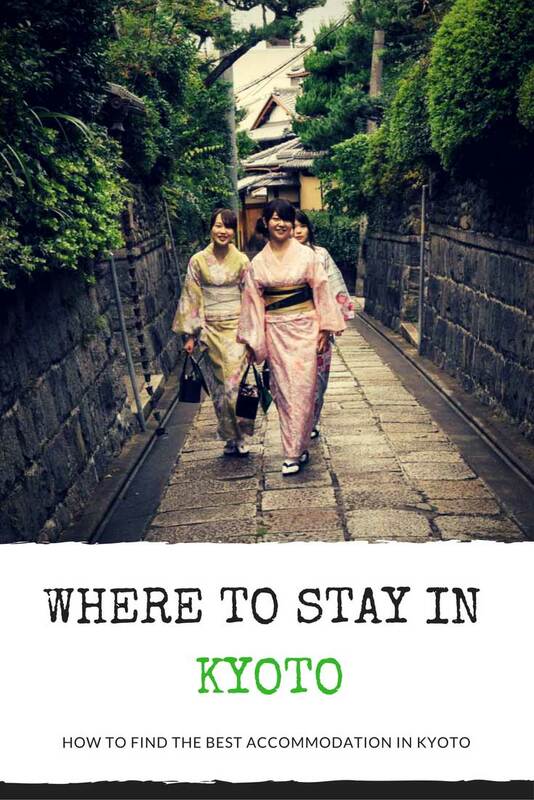 In this article, we summarize what we think are Kyoto’s best areas to stay in and why. For each area, we have listed our favorite hotels and Ryokans at every budget – Top-End, Mid-range, and Budget. 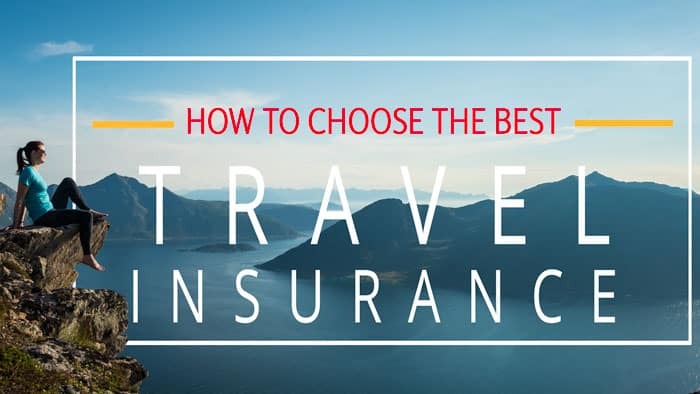 Whether you’re looking for that beautiful world-class luxury hotel, with unbeatable Japanese service, a night in a traditional Ryokan (Japanese Inn), a good midrange hotel, or a cozy budget guesthouse we have a recommendation for you. 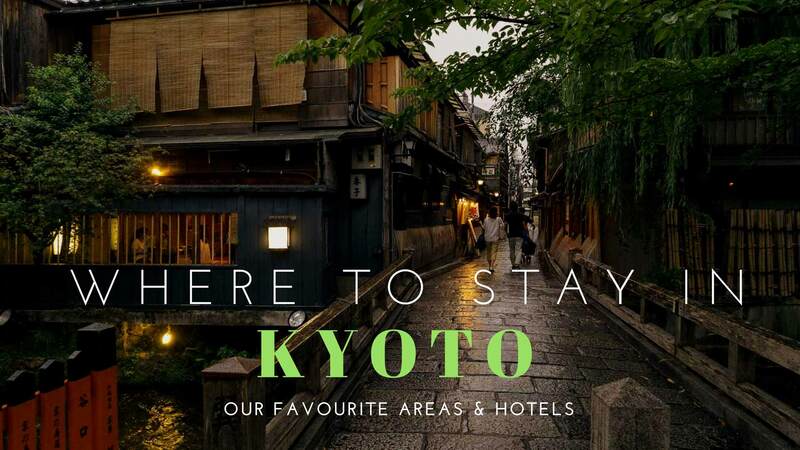 In Kyoto, you will find everything from Luxury Hotels that can rival the finest in the world to affordable business hotels for the businessman that did not make it home after the evenings drinking and anything in between. 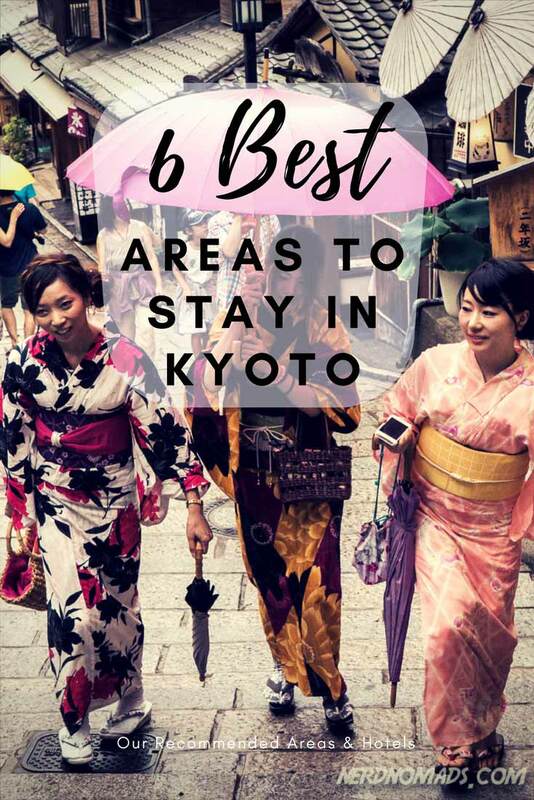 If you would like to stay in a Ryokan, a traditional Japanese Inn, where you sleep on futon mats and eat a traditional Japanese dinner then Kyoto has more Ryokans than any other city. If you are curious about staying in a Ryokan you can read about our Ryokan experience. Researching this guide has been a massive task that started before we even left for Kyoto, continued through the time we spent there and beyond. To make this as complete and as useful a resource as possible, we have in addition to our own, included some recommendations from people we know and whose opinion we trust. 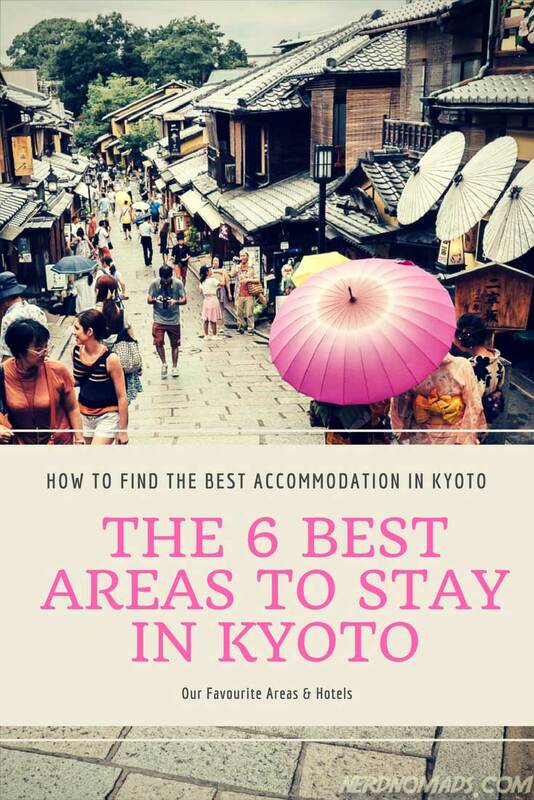 We hope you find this guide helpful in finding the best place to stay in Kyoto! Downtown Kyoto covers an area in the center of Kyoto on the west bank of the Kamo River. It includes the historic Ponto-Cho Geisha district as well as the modern shopping district of Shijo. 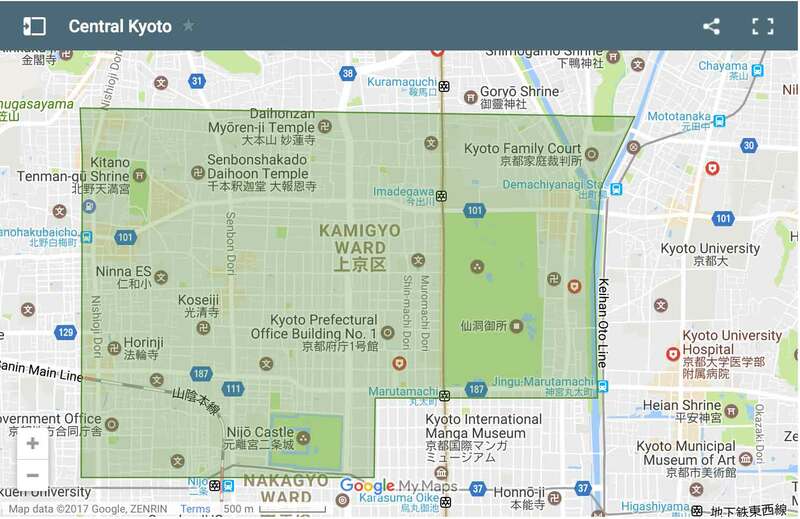 Why Stay In Downtown Kyoto? 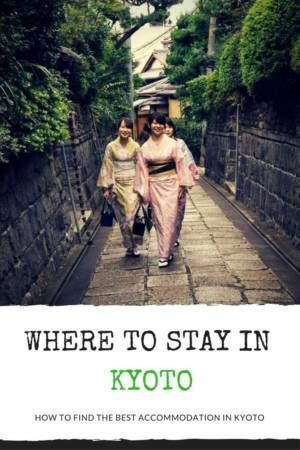 Most visitors to Kyoto choose to stay in this area and for good reasons. There are some very very nice hotels here, and the area offers a pleasant break from all the temple watching. If you want to stay in an area with easy access to hundreds of shops, malls, restaurants, bars, food markets and excellent nightlife this is the place. The famous sight-seeing areas of Southern Higashiyama is within walking distance. The cities two main subway lines also run through here along with a couple of train lines making it easy to get around the rest of the city. Downtown has lost a bit of its old world charm to modern development, and flashy neon signs have long since replaced the once handpainted signage. Nishiki market – It’s a lot of fun walking through this huge food market with all the strange and wonderful food on display. It’s also perfect to visit on a rainy day with it’s covered roof. Kyoto International Manga Museum – Here you will find more than 300 000 Manga comic books from all over the world. Manga is a big part of Japanese culture, and this is an excellent place to learn more about its history. The exhibition is in Japanese and English. 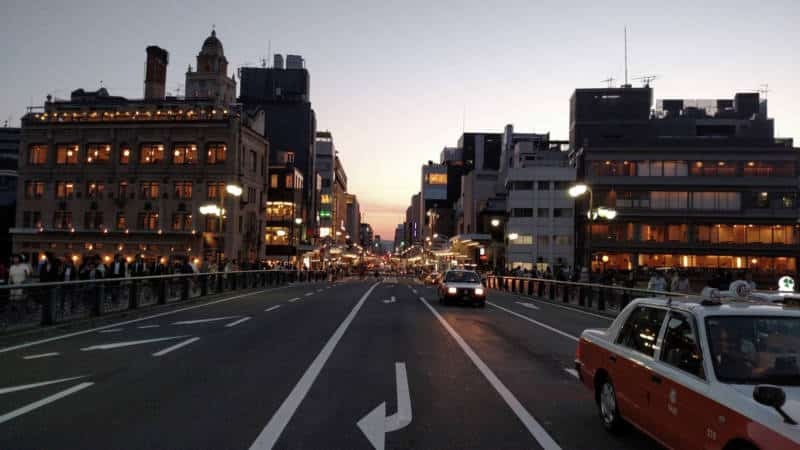 Shopping – The Shijo district is Kyoto’s most modern shopping district with shopping malls such as Takashimaya and Daimaru that can rival Tokyo. The pedestrian only covered streets of Teramachi-dori and Shinkyogoku are also popular with shoppers. Ponto-cho – A traditional nightlife area and one of the five traditional Geisha/Geiko areas in Kyoto. The narrow alley Ponto-cho is especially atmospheric in the evenings with its traditional wooden houses and Japanese lanterns. The elegance and sophistication of Ritz-Carlton coupled with a unique Japanese flair for style, this is truly a quiet oasis of luxury in the heart of Kyoto. It’s pricey but perfect for that honeymoon or that once in a lifetime splurge! Service is as expected world class and its location overlooking the river is spectacular. The rooms are large and beautifully designed, the swimming pool is lovely, and the hotel’s many restaurants are all excellent. 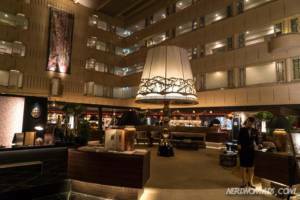 The Hotel Okura is an older, but classy hotel that is surprisingly affordable. The rooms are spacious, comfortable, elegantly furnished and thanks to some heavy duty sound isolation, very quiet. A direct connection to the Kyotoshiyakusho-mae Subway Station right next door makes getting around the city very easy. 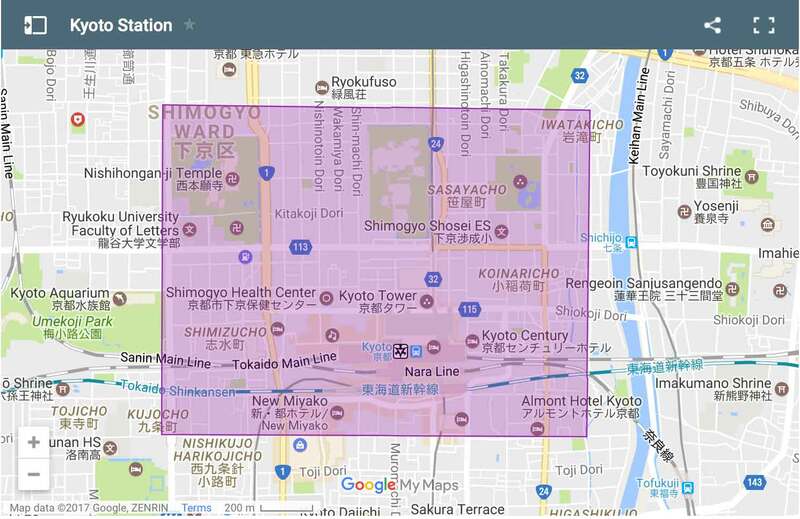 Ponto-Cho and the shopping areas of Shijo and Karasuma are all within easy walking distance. The breakfast buffet is excellent and served on the 17th floor with views overlooking the river. They even have an in-house bakery as well as several restaurants. A new modern hotel in a fabulous location overlooking the Kamogawa river. 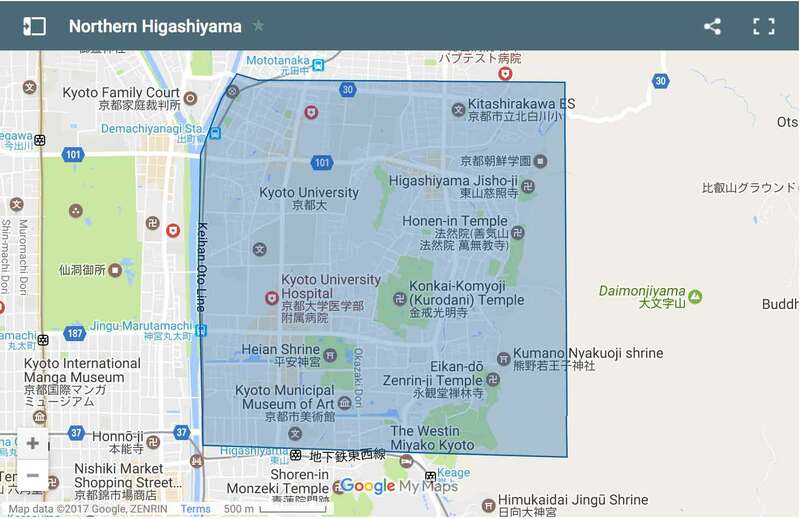 It is within walking distance of Gion and the temples of Souther Higashiyama as well as public transportation. The rooms are in a modern style, spacious and comfortable with some nice touches such as rain showers and a huge flat screen TVs and fast Wifi. There is a lovely indoor Onsen (bath house) to enjoy after coming back from sight-seeing. This popular hotel is in the perfect location! Here you are right in the center surrounded by plenty of eateries and shops and with easy access to public transportation. 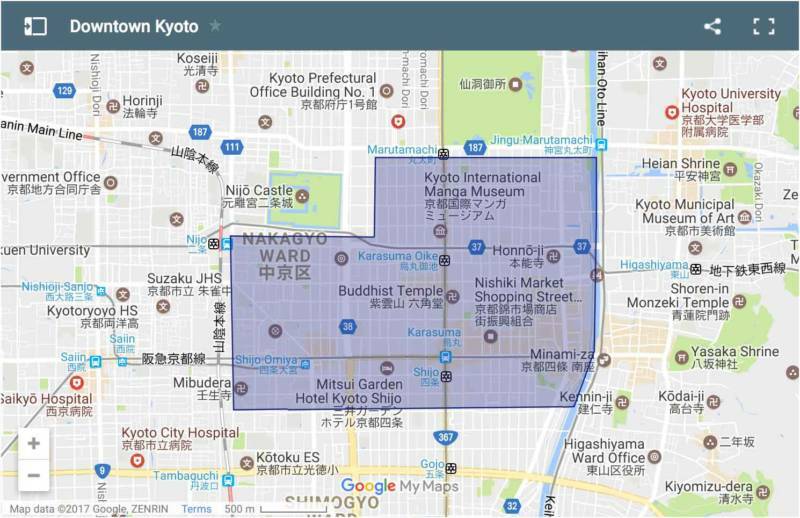 The famous temples and Geisha areas of Ponto-cho and Gion are within walking distance. The rooms are relatively small but modern and comfortable, with private (and surprisingly spacious) bathrooms including a shower and bathtub area. The staff is great, and they also serve an excellent breakfast. A lovely hotel centrally located in the shopping district, yet with the temples and old town of Gion within easy walking distance. The rooms are small but clean, modern and comfortable. There is a free Onsen/ spa on the third floor. 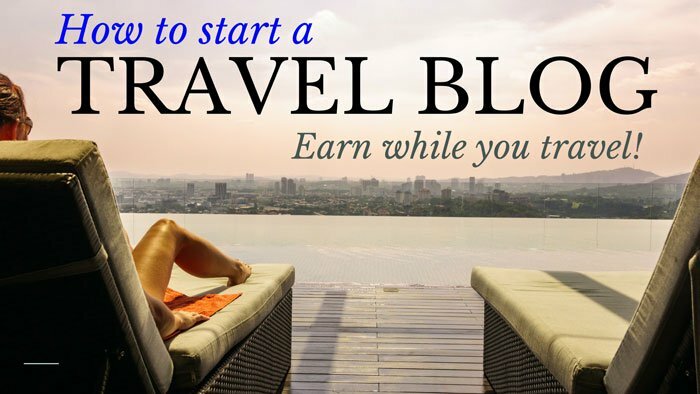 A great budget hotel that offers excellent value for your money. The rooms are relatively large, modern and spotlessly clean with beautiful decor and equipped with air-con, fridge, and free Wifi. Its location is excellent as well, almost in the middle of the Sanjo shopping lane which is a pedestrian only zone making it nice and quiet inside the hotel. A clean no frills budget hotel in a good location in the center of Downtown Kyoto. The rooms are tiny but the beds are comfortable, and the subway station is just a minute walk away. 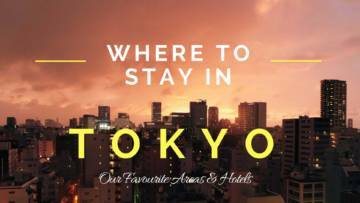 We stayed at Hotel Mystays in Tokyo and loved it! Hotel Mystays is a business hotel chain. The rooms are not the biggest but have everything you need and more (even slippers!). 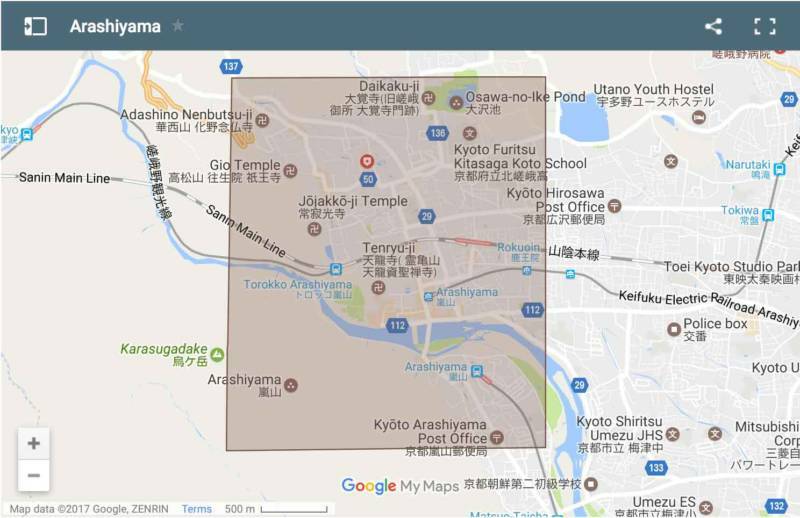 The location of Mystays Kyoto is close to Maruyama Park and many shrines, and very close to a subway station (300 m) and bus stop. There is a good selection of restaurants nearby, and there is a supermarket next to the hotel. It is a quiet hotel, and all rooms have good wifi. There is a laundry room with washing machines and dryer, as well as a coffee machine in the lobby that can be used free of charge. “The narrow alleyway lined with old Machiya houses is lit by the warm glow of lanterns this evening, much as it has been for hundreds of years. Inside a nearby house, behind thin softly lit paper covered windows, I can just make out the silhouettes of girls in their Kimonos dresses pouring tea in a traditional tea ceremony. Gion is arguably Japans most famous Geisha district, and it offers a fascinating glimpse into Japan’s past. Here you can still meet a Geiko girl and her Maiko understudy in their beautiful traditional Kimonos, as they make their way to entertain their guests. The architecture is among the best-preserved examples of the time to be found anywhere in Japan. A little further west towards the mountains lies the Southern Higashiyama temples, Kyoto’s most famous attractions. The area is brimming with colorful temples, shrines, parks and Zen gardens. 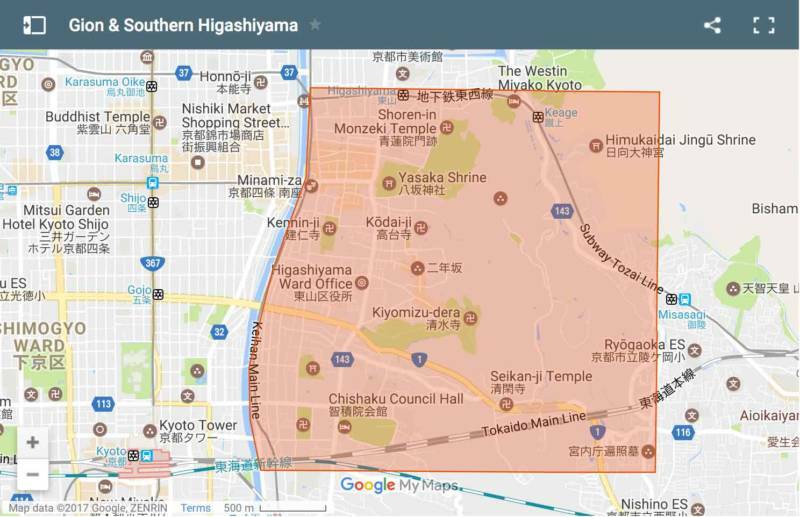 Why Stay In Southern Higashiyama? By staying in the Southern Higashiyama area you are right in the heart of the most beautiful ancient temples and shrines that Japan has to offer. The streets Ninen-zaka and Sannen-zaka are packed with cozy traditional tea houses, shops, and restaurants. Gion (northwest of Southern Higashiyama) is the oldest Geisha district in Kyoto. The streets here are lined with beautiful old wooden shops, restaurants and tea houses. It gets crowded so expect to walk the streets and temples together with many other tourists from both Japan and the rest of the world. Accommodation prices here tend to be high, and there are few budget options. Kiyomizu-dera Temple – Kyoto’s most famous temple and a well-known landmark from a thousand photographs and postcards. The view of the city from here is breathtaking. Kennen-ji temple – this is the oldest Zen temples in Kyoto, and it also has a spectacular garden. Ishibei-koji Lane – the most beautiful lane in Kyoto with its small traditional wooden houses and shops. Here it is easy to lose yourself in old Japan. Other notable temples and shrines like the Shoren-in Temple, Chion-in Temple, Yasaka-jinja Shrine, and Kodai-ji Temple. Gion – This district is arguably Japans most famous Geisha district. Try the Kyo-ryori (Kyoto cuisine) – Gion is an excellent place to try Kyoto’s traditional refined cuisine. Attend a tea ceremony – Gion is an excellent place to try a traditional Japanese tea ceremony. Kyoto National Museum – Kyoto’s main museum often houses special exhibitions that are well worth a visit. A high-end Ryokan a short stroll away from the historic Gion district that is very popular among foreign visitors. So if you are a bit nervous about your first Ryokan experience then this is an excellent choice. The rooms are large, with beautiful Japanese style decor as well as a seating area and balcony. All rooms have a private bathroom that has a traditional Japanese soaking tub. The staff speaks good English, and the service is impeccable. The Onsen (Japanese hot spring bath) is lovely. Breakfast and dinner are included in the price. They serve a wide range of options, all with English menus, and they are delicious and beautifully presented. The new Four Seasons Kyoto really lives up to its reputation as one of the finest luxury hotels in Kyoto. The rooms are large and exquisitely furnished with every comfort. If you need a bit of a break from exploring Kyoto, there is a beautiful Japanese pond garden, tea house and Onsen (Japanese hot spring bath) at the hotel. The hotel also has a large swimming pool, a very well equipped fitness center, and a spa. You can choose from several restaurants at the hotel, all of a very high standard. It’s the perfect location from which to explore Gion, and famous sights such as Kiyomizu Temple are also within walking distance. This new boutique hotel, located in a fantastic location about a block away from the heart of Gion, beautifully mixes the traditional with the modern. The rooms are large (for Kyoto) and furnished with comfortable beds and all amenities such as free WiFi and flat-screen TV. The attention to detail is evident everywhere in the room from the lovely bathrooms with traditional bathtubs made of cedar wood, to the Japanese art books and Nespresso machine. The staff are super friendly and provide a real five-star service. The hotel’s restaurant is also excellent. Highly recommended! This Gion Hotel is in an excellent location with both the old city and the temples within easy walking distance. There is also a nearby bus and subway station. The rooms are a bit sparse but clean and well equipped with free Wifi, flat screen tv, fridge and a large private bathroom. They serve an excellent breakfast buffet with both Japanese and western dishes on offer. A new hotel with a very modern, light, and airy feel. The rooms are spacious with comfortable beds and have everything you need. Staff are kind and helpful and speak English well. The location is excellent too, close to the Sanjo subways station and within walking distance of many shops and temples. More of a flat rental than a hotel this fresh new place provides excellent value for money. The rooms/ apartments are spacious, spotlessly clean and well equipped with a sofa for sitting, air-con, flat screen TV, and free WiFi. There is a kitchenette with fridge, microwave oven (but strangely few utensils), and a washing machine. There is no daily housekeeping. It’s close to the main street of Gion and close to the bus stop and about a 15 minutes walk away from the nearest subway. Kyoto railway station is one of the largest railways stations in Japan. In a city famous for its well-preserved historic buildings the railway station shows the modern Japanese architecture at its best. It is well worth exploring the station in its own right. There is a great view of Kyoto from the rooftop terrace on the 15th floor. This is a very popular area for visitors to stay in and there are plenty of good accommodation options around here. 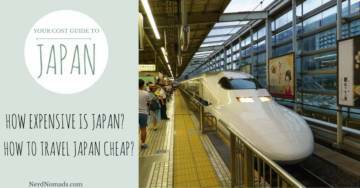 Why Stay Around Kyoto Station? The best reason to stay here is the convenient transportation. Kyoto station is the main transportation hub for Kyoto city and staying in this area gives you easy access to the entire city as well as day trips to surrounding sights such as Nara, or the spectacular Fushimi Inari shrine. To get around Kyoto use the buses stop right in front of the station or the Subway. There is also plenty of restaurants, shopping malls, and even a cinema complex inside the station. The area around the station is packed with small shops and eateries. Unlike many European railway station areas, this is a safe area to stay in. There are not a lot of sights in this area, except for the Kyoto Station building itself, so you need to take transportation to explore most of the main sights of Kyoto. Higashi Hongan-ji Temple – One of the few temples within walking distance in this area. Stil, it is a very impressive one. 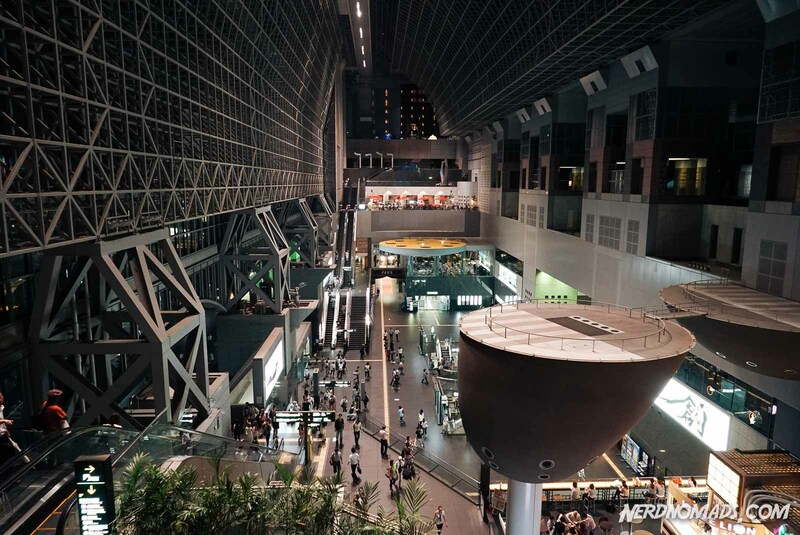 Kyoto Station – the station itself with its modern architecture, hundreds of shops, restaurants is well worth exploring. This luxury hotel mixes the best of Japanese design with a Western-style boutique hotel. The result is a truly beautifully designed hotel that is an experience in its right. Rooms are in a modern Japanese style, large and extremely comfortable with flat screen TV, fridge, and excellent Wifi. The staff is exceptional and will bend over backward to provide you with the very best personal service. Its location is in a quiet part of town, but you can walk to Kyoto station in about 15 minutes or use one of the complimentary bikes available to explore the area. This hotel is located within the Kyoto Train station! But don’t let that scare you because it’s a great hotel and it’s hard to beat the convenience of stepping off the train and right into your hotel after a long journey. The rooms are quite spacious with super comfortable beds, free wifi, and flat screen TV. There are plenty of good restaurants nearby. They even have a large indoor swimming pool and gym, although they rather stupidly charge extra for the use. We stayed at this hotel for a week, and it was awesome! The best hotel we stayed at throughout our whole Japan trip! Big beautiful and modern rooms, huge comfortable bed, great service from the staff and excellent location just next to Kyoto Train Station (100 m). Excellent fast wifi too. You will love this hotel! A mid-range hotel a few minutes from Kyoto Station that ticks all the right boxes. It’s clean, neat and although the rooms are small, they are comfortable and well equipped. The bathrooms are very nice and surprisingly have both a shower and bathtub. The coin-operated laundry machines are super convenient. Breakfast is a little basic, but there are plenty of good eateries around the hotel. 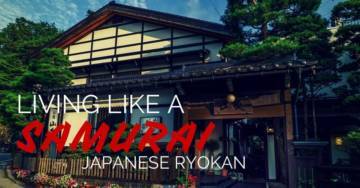 Ryokans (a traditional Japanese Inn) can be extremely expensive, but this beautiful traditional Ryokan is quite affordable. It is run by some seriously charming Japanese ladies that will take excellent care of you. Try the traditional five-course Kaiseki Japanese dinner, it is quite the experience and well worth the price. Soaking in the Onsen (hot public bath) after a day of sight-seeing is fantastic. You can walk to Kyoto station in about five minutes. This guesthouse is located in a quiet neighborhood about 500 meters away from Kyoto station. The rooms are spacious and clean with comfortable beds and private bathrooms. There is free Wifi, a small kitchenette as well as a washing machine. The rooms are self-service and are only cleaned between guest stays. 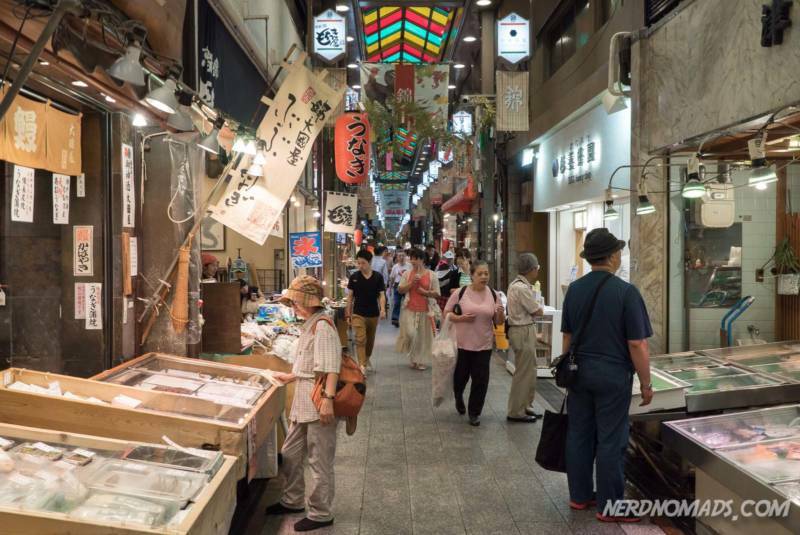 Covering a large area in the center of Kyoto, this district is a mix of both old and new. It has some beautiful sights such as the Kyoto Imperial Garden, and the Nijo-ji Castle but it’s modern day life that for the most part dominates this area with convenience stores and office buildings. Why Stay In Central Kyoto? While not among the most popular areas to stay in, you can still find some excellent hotels here that are not too far away from a subway stop. You will also have no trouble finding places to eat. The area is quite flat and can easily be explored on foot or by bike. There are a few popular sights in this area such as the Kyoto Imperial Palace and the Nijo-ji Castle, but you will still need to use public transportation to explore Kyoto’s most famous sights like the Higashiyama area. Kyoto Imperial Palace Park – It’s mainly the park around the Imperial Palace that is impressive and not so much the Palace itself. Go for a walk or bring some food and have a nice picnic. It is at its most beautiful during cherry blossom season (late March). Daitoku-ji – If you have an interest in Japanese gardens then this collection of 24 temples and several beautiful small gardens are a lovely way to spend some time. Nijo-jo Castle – An impressive castle with huge surrounding walls built by the Shogun warlords during the Edo period. The gardens surrounding it are also beautiful and are lit at night. Get here early in the morning to avoid the crowds. The Noku Kyoto is an excellent boutique hotel located at the southwest corner of the Imperial Park and less than a minute away from the Marutamachi Subway Station. Every room is spacious (by Japanese standards), clean, comfortable and well equipped with a flat screen TV, air-con, free Wifi and a fridge, along with large private bathrooms. You can walk to the Imperial Palace as well as the Nijo castle in less than 10 minutes. A popular mid-range hotel located right across from the Nijo castle. It’s an elegant hotel with a spectacular lobby and excellent service. The rooms are getting a little dated but are large, comfortable and clean. The breakfast buffet is very good. The hotel provides a free shuttle bus service to Kyoto station every 15 minutes, but it is also easy to walk to the nearby Nijojo-Mae Metro Station. It’s one of the very few hotels in Kyoto with an indoor swimming pool! 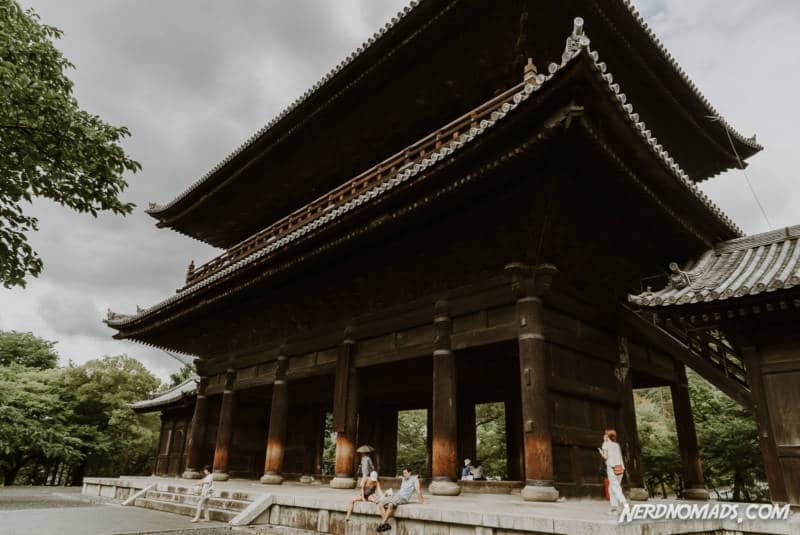 The Northern Higashiyama district has just as many stunning old temples, shrines and Japanese Zen gardens as it’s Southern Higashiyama neighbor and yet the crowds are mostly absent. Here you can easily find yourself almost alone exploring some of these ancient masterpieces. The main sightseeing area stretches from the Ginkaku-ji temple, also knows as The Silver Pavillion, in the north to the Nanzen-ji temple in the south. Linking them together is the famous walking route referred to as the Path of Philosophy. Why Stay In Northern Higashiyama? It’s a beautiful and relatively quiet part of town. While there aren’t that many options for accommodation in Northern Higashiyama, there are some nice Ryokans (traditional Japanese Inns) in this area. Your choice of restaurants and evening entertainment will be a bit limited. You’re not very far from downtown though, and a quick bus trip or even a bike can easily get you there. Ginkaku-ji Temple – Known as the Silver Pavilion, the temple did not get its name from being covered in silver but rather to contrast it from the Golden Pavilion temple. It’s lovely going for a walk here among the half a dozen temple buildings, a moss garden, and the rather uniquely dry sand garden. The Path of Philosophy/ Tetsugaku-no-Michi Street – A pedestrian path that goes along a canal beautifully lined with cherry trees and flowers. The name comes from the 20th-century philosopher Nishida Kitaro who used to wander this street lost in thoughts. The walk takes about 30 minutes. Kyoto’s museum district (Okazaki-koen) – Here you can explore several excellent museums dedicated to Japanese art, such as the Kyoto Municipal Museum of Art and the National Museum of Modern Art. Heian Shrine – Perhaps the most impressive Shinto Shrine in Kyoto with a 25 meter high Tori gate. The garden and pond are lovely during the cherry blossom season. Once upon a time a royal residence, this historic Ryokan is a beautiful place to have your traditional Japanese Inn experience. Located in a secluded area of Kyoto with lovely views of the mountains to the east of the city you can escape the hustle and bustle of Downtown here. The traditional multi-course Japanese dinner is a must-try experience. The rooms have a classic style with Futon mats to sleep on and shared bathrooms. Wifi is available throughout the Ryokan. It’s a family run ryokan, and the staff is super friendly and speak good English. Located at the foot of Kyoto’s western mountain chain, it is often considered to be Kyoto’s number two sightseeing district after the Higashiyama area. It is a gorgeous area, with green hills and majestic mountains in the background. The area is especially popular during the cherry blossom season (March – April). The main draws here are the Tenryu-ji Temple and The Bamboo Forrest. Staying in the Arashiyama area, you are close to some truly stunning nature. And as long as you avoid the almost theme park like main streets, it is a tranquil rural area that is especially enjoyable to explore on a bicycle. Although it is not a very popular area to stay in for foreigners, it does have some beautiful Ryokans. Arashiyama area is quite far away from the center of Kyoto (roughly a 30 min drive). The main street and the Togetsu-kyo Bridge is busy with tourists from early morning until late evening. Bamboo Forest (Sagano Bamboo Forest) – A beautiful bamboo forest grove that is an absolute must experience in Kyoto. Tenryu-ji Temple and Garden – In proximity to the Bamboo Forest, the Tenryu-ji temples is ranked among the top five Zen temples in Kyoto. Okochi Sanso Villa – The home of the famous samurai actor Okochi Denjiro. The villa is surrounded by a beautiful Zen garden. Monkey Park Iwatayama – Over 200 Japanese monkeys live in this park, of all sizes and ages. Arguably the finest traditional Ryokan in Arashihama, it is located in a great location close to the main tourist district, yet the area is quiet with lovely views of the river. Their traditional Kansei meals (traditional Japanese dinner and breakfast) are excellent. The hotel also has a beautiful Japanese garden and a hot spring bath. 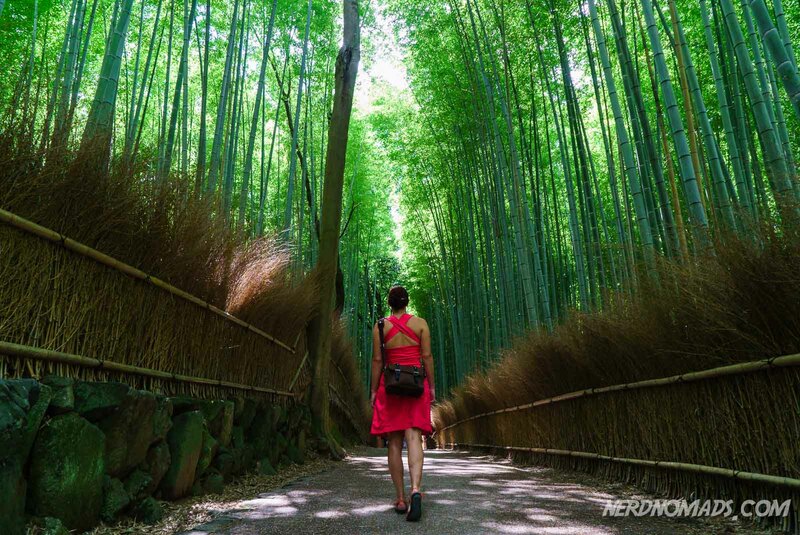 You can walk to both to the center and The Bamboo forest in less than 15 minutes. The staff is the very model of Japanese politeness and service. This is a Ryokan style Inn but with some modern twists that cater towards foreign guests with western style beds in spacious, comfortable rooms. There is an outdoor Onsen (hot spring bath). The staff is very welcoming and will go out of their way to help you although their English is a little limited. It’s tucked away from the busy Arashiyama center with a lovely view of the river. 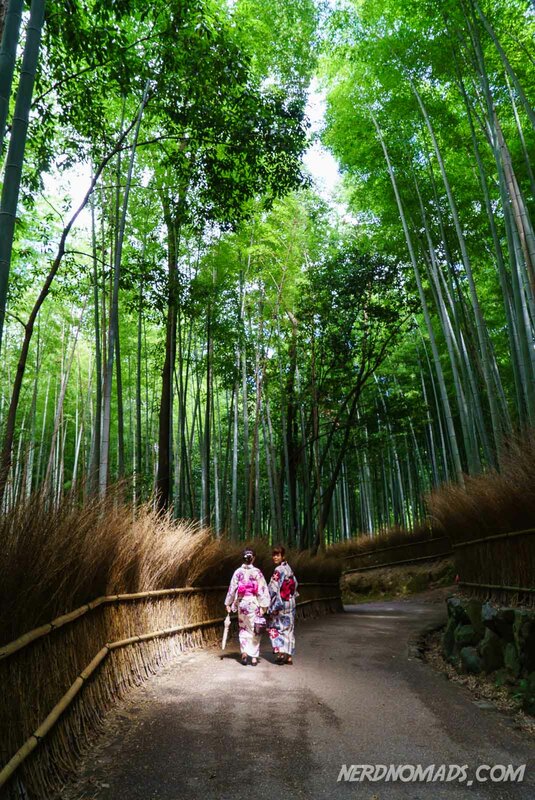 The Kyoto Bamboo forest and the Monkey Park are both within easy walking distance. Be aware that they do not serve food. 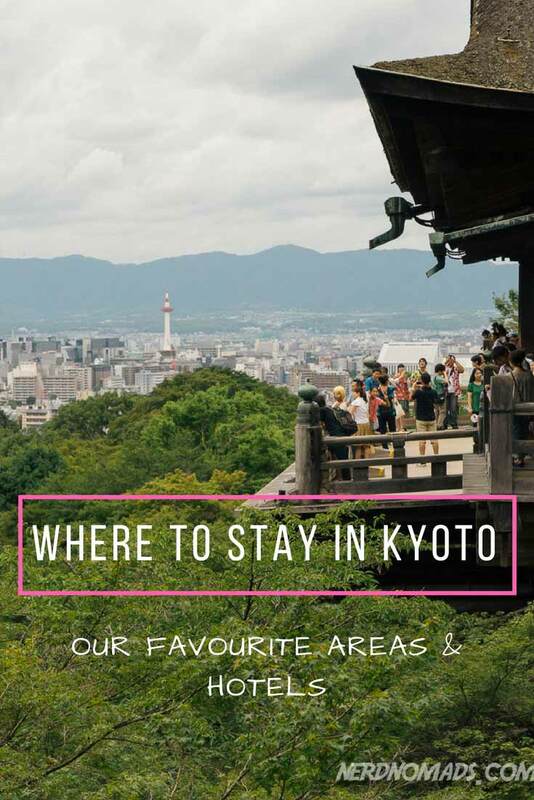 It’s been a lot of work creating this guide, and we are happy to finally share our favorite hotels and areas to stay in Kyoto with you. Hopefully, you now know a little more about Kyoto’s many areas, and it has become a little easier for you to decide where to stay in Kyoto. Also, if you want some inspiration for what to do in Kyoto then be sure to read our 3 Day Kyoto Itinerary. We will be constantly adding accommodations to this guide and keeping it updated, so please let us know if you have any tips for hotels we should check out! I stayed at Kyoto Hana Hotel for 4 nights during my first-time visit to the wonderful city of Kyoto. The location of the hotel is perfect for exploring Higashiyama and Gion and the city center with its shopping arcades is in walking distance. The Sanjo train, bus and subway station is right around the corner and connects you with more remote attractions such as the Arashiyama bamboo forest or the Fushimi-inari shrine. My room was perfectly clean and neat and there were supplies of high-quality shampoos, lotions, hand and face wash etc. They also provided a pyjamas, tea, slippers, towels and bath salt for free. Staff was extremely polite, welcoming and helpful for example in finding a coin laundry or recommending restaurants nearby. Everything was quiet at night so you could get rest after long days of sightseeing. The price is absolutely justified given the comfort they offer. I definitely recommend the place and would stay there again. Thank you so much for this hotel tip! 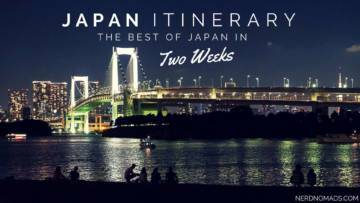 We will for sure check it out on our next visit to Kyoto! Wow, you covered a lot of information here. I’ll have to bookmark this for when I head there in the near future! Thank you so much! Glad you like our article and found it useful. You should definitely visit Kyoto one day, it is an amazing city! I had stayed in the downtown. Will definitely go for another one next time. Thanks for sharing. Kyoto downtown is a great area to stay in. Very easy to get around the city. Although I’m not planning to go to Japan in the nearest future, it’s definitely on my list so I will come back and check your post again, thanks for all these great tips! Thanks! Japan is an amazing country, especially for us “nerds”. 🙂 Tokyo feels like stepping into the future with all its craziness and technology. Kyoto is also a real must when visiting Japan. These places are an awesome idea! I will love to stay in any of those! Thanks, Agness! Kyoto has a lot of nice areas and hotels! First of all I really thank you for sharing such amazing and useful photos.I will keep in my mind your advices while Im going there.I like Lonely Planet’s Travel Guides also.Kyoto is the place where I want to go first. Thank you so much, Balayi! Kyoto is one of the highlights of Japan, and a place that you definitely should visit if you are heading to Japan. Lots of amazing spots to lay your head in Kyoto … can’t wait to visit someday soon! 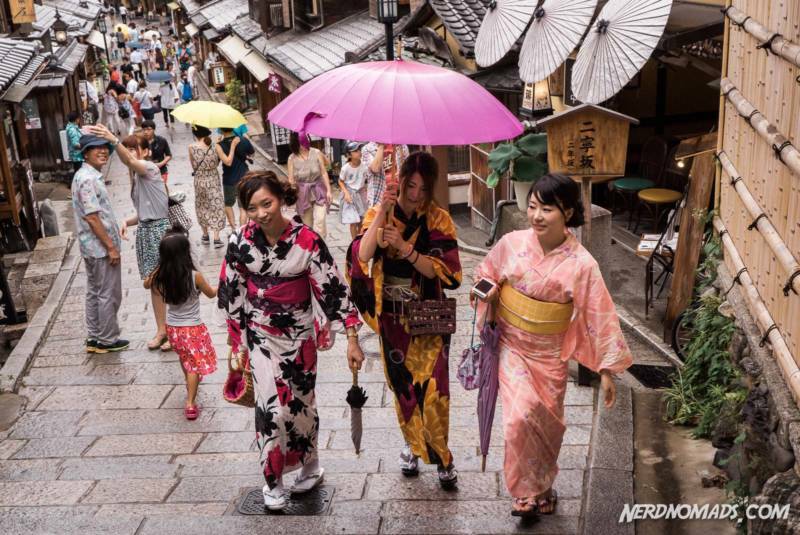 Yeah, Kyoto is great, both when it comes to hotels and sights! So much to see and do in this stunning city. 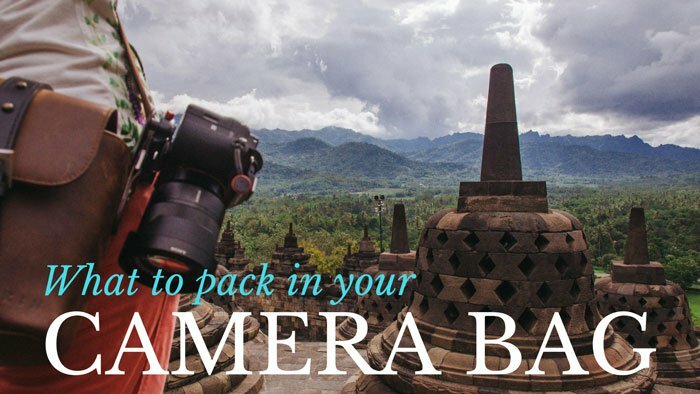 Starting to plan my October trip and this guide has been super helpful — thank you! Could you share the location of the top photo with the title of the post? Thank you so much! 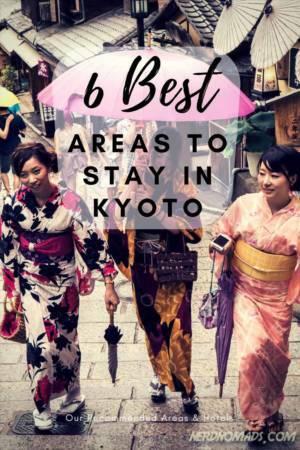 Glad this could be of help to you when planning your Kyoto trip! The top photo is from the Gion area of Kyoto. It is a really nice and atmospheric area packed with old wooden buildings and if you are lucky you can even get a glimpse of a real Geisha! Have a great trip to Kyoto and Japan in October! Their culture is so interesting and since I’ve studied Japanese by my own, I’ve always wanted to visit Japan and spend time indulging in their amazing way of life. This travel guide is so useful, thank you so much! Thank you so much, Phoenix! I agree, Japan is amazing! I just keep wanting to come back over and over again. So cool that you have studied Japanese! It seems like a very difficult language to learn. Thank you so much for such a wonderful & comprehensive guide! This is exactly what I was looking for when planning my visit to Kyoto. Thanks so much! Thanks a million! Kyoto is such a nice city with plenty to see and do. You will love it! I need a guidance on some service apartments for a family of 3 adults near Kyoto station area, preferably with a kitchenette. Any suggestions? On TripAdvisor.com you can limit your hotel search to Kitchenette and Near Kyoto Station. Another option for you could be to check out Airbnb.com. Good luck with finding the right accommodation! Have a great time in Kyoto! Love this guide and can’t wait to use it in April- Not sure where Im staying yet, have Solaria, Rhyga and Century booked.any suggestions…… We are from US and will be using their trains and such without a tour guide…. Thanks a million! So cool that you are visiting Kyoto in April! You will love this beautiful city! It is full of charm and there is plenty to see and do. Both the Solaria Hotel and the Century Hotel which you have booked are excellent hotels! They are both new hotels and have big comfortable rooms. Both hotels are close to the train and public transport. You will not go wrong if you stay at one of these hotels. We stayed a week at the Century Hotel and loved it! It is right next to Kyoto Train Station so it is very convenient and easy to get around Kyoto and out of the city for day-trips. Have a great trip to Kyoto in April! How to get there: Train or bus. The nearest airport is in Osaka.